The private room is also equipped with Wi-Fi and a projector with screen. Both of which are available to use at no extra charge. Cancellation of private dining bookings must be 10 working days prior to the date of the booking. Cancellations made after this time will be charged at the full price of the menu ordered. Unless otherwise agreed in writing, settlement of all fees/charges incurred in reserving and/or using the facilities, is to be made by the client on the day of use. We reserve the right to terminate this agreement and/or the use of the facilities if fees are not settled by the due date. Alternatively, if previously agreed, an invoice will be raised on the day of the event and sent to the customer for payment. Our payment terms are strictly 7 days from the date of invoice. All room hire and equipment hire rates are quoted inclusive of VAT. 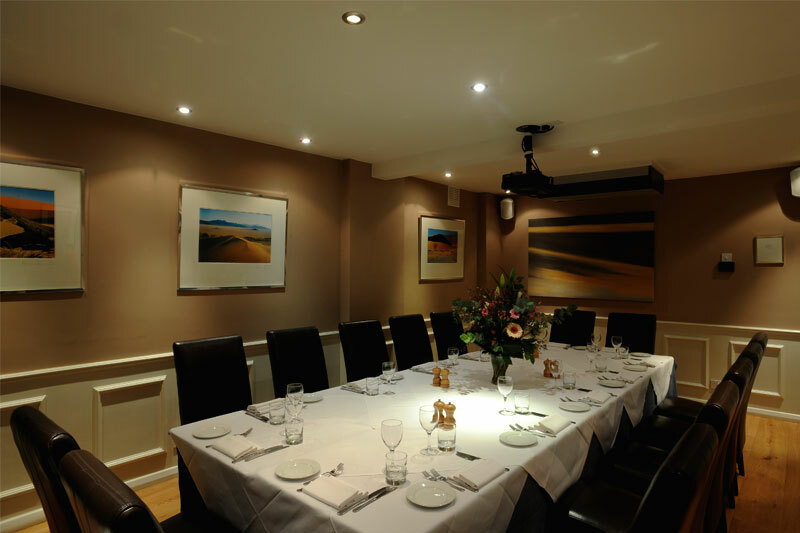 Minimum spends are applicable to private dining bookings and parties requiring exclusive room or venue hire. The minimum spend applies when the number of delegates for a private dining function is equal to or less than 11 (based on a spend of £70 per head) and equal to or less than 6 (based on a spend of £80 per head). When the number of delegates is 12 or greater, the minimum spend may be wavered, if previously agreed. The agreed minimum spend is based on food and beverage expenditure only, but if agreed, can also incorporate the service charge of 12.5%. In the event of late payment, we reserve the right to charge interest on a daily basis from the date of expiry of the credit terms stated, until the date payment is made, at the rate of 5% above the current Bank of England base rate. We reserve the right to cancel any future bookings if payment is overdue. In the event that a client is made bankrupt, ceases to trade or placed in receivership, we shall be entitled to terminate this contract immediately by giving notice in writing to the client to do so. Any damage to the rooms or their contents, whilst occupied by a client and incurred as a result of the client or their employees/representatives, will result in a charge to remedy such damage. We do not accept liability for theft, loss or damage of client/visitor property, although all efforts will be made to ensure the safety of such belongings. A Service charge of 12.5% will be added to all food and beverages.